Contact each member of the secretariat here. The European Marine Board Secretariat are situated in former warehouses of the fish auction hall of Ostend and are located on the eastern bank of the port. The buildings offer a view of the port channel and the city centre of Ostend. 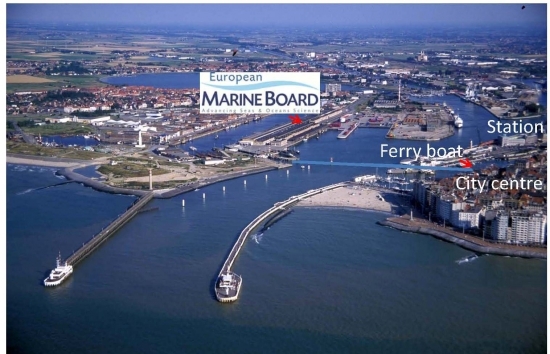 The Secretariat offices are offered to the Marine Board by the Flemish Government. The official inauguration took place on 14 May 2008. At the end of the E40/A10 motorway you enter Ostend (Oostende in Dutch) and follow exit 4 in the direction of Blankenberge (N34). After passing lights, a roundabout and the viaduct you turn left at the third lights in the direction of Vismijn. Proceed all the way to the end of Vismijnlaan and turn to the left after having passed the fish auction hall. Parking facilities are available in front of the main entrance number 68, at the waterside. If you travel from the Brussels Airport, you can take train to Brussels (North, Central or South stations) or Gent and make one change to the train to Ostend. The railway station is situated at level -1 of the airport. Door-to-door train journey from the airport to Ostend takes 1.40 to 2 hours, depending on the itinerary (the fastest way is via Brussels North). A small ferry boat regularly circulates between the North Sea Aquarium (Noordzeeaquarium), situated at approx. 6 minutes walk from the railway station, and the InnovOcean site. As you exit the station, turn right and walk along the Visserskaai embankment until you reach the Aquarium. The boat is free of charge and the crossing of the harbour takes no more than 2 minutes. As you leave the boat, the InnovOcean's long two-storied building will be clearly visible on your right. The European Marine Board entrance is number 68. Take a tram at the Ostend railway station in the direction of Knokke to the tram stop called ‘Weg naar vismijn’ (next stop). Get off, cross the tram line and follow the signs ‘Vismijn’ and ‘VLIZ’. Continue along old warehouses (at your right) all the way to the end of Vismijnlaan and further to Wandelaarkaai. The main entrance is number 68, Wandelaarkaai 7. This walk takes about 10 min. You can also take bus 9 (Groenendijk-Sas Slijkens) on bus platform 12 in front of the railway station. Get off at the bus stop called 'Sluisplein' (next stop). Cross Moreauxlaan (going in the direction opposite that of the bus), cross the tram line, and continue in the direction of Vismijnlaan as explained above. Taxis are available at the station. The InnovOcean site building (Wandelaarkaai 7) contains many entrances, specify to your driver that the European Marine Board is at entrance 68.